Veronica Gerber Bicecci’s debut novel, second book and her first translated into English, Empty Set (Conjunto vacío), has multiple dualities—the verbal and the visual, the analytic and the emotional, autobiography and fiction—that aspire to convey ineffable sums greater than their constituent parts. Gerber Bicecci’s bio describes her as a visual artist who writes. The text of her novel is accompanied by conceptual line drawings described by other critics as Thurberesque though lacking Thurber’s humor, some of which are calligraphic, others dendrochronological, but most are geometric Venn diagrams. Names in the text are followed by initials in parentheses that also appear in the drawings on geometric shapes corresponding to particular characters. The text and accompanying drawings are presented in one- to four-page chapters/sections that read like poems (with lots of negative space) or linked short stories. As for the events related in Gerber Bicecci’s novel, in the same interview she says, “I would lie if I say it is all autobiography, but I’ll be lying too if I say that everything is fiction. It is amphibian.” That places her in the company of other writers of meta-fiction, such as Ben Lerner (whose novels 10:04 and Leaving the Atocha Station are also reviewed at NYJB). That’s probably just the sort of artifact from their mother’s private life her children do not want to see. Veronica finds it “spine chilling.” Veronica’s contact person on the job is Marisa’s son Alonso(A) with whom she becomes romantically involved. 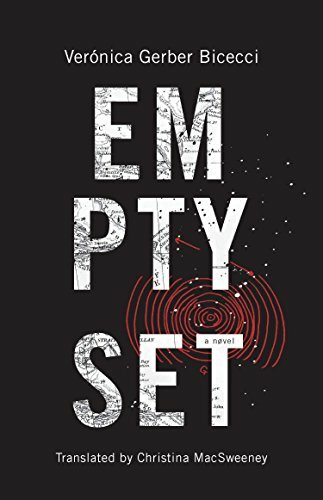 Empty Set invites its readers to both approach its imagery empathically and simultaneously view it with critical perspective. Fans of elliptical experimental fiction will welcome the challenge. An afterward by translator Christina MacSweeney (with drawings by the author) explains some of the challenges posed by Gerber Bicecci’s Spanish and MacSweeney’s choices, such as dropped pronouns.